GAGGIA was founded over 50 years ago by Achille Gaggia and is synonymous throughout the world with ESPRESSO and CAPPUCCINO coffee. Achille Gaggia produced the first modern steamless coffee machine on 5 September 1938. His ingenious idea of forcing water pressure to flow over the coffee grounds produced the 'crema' that has made espresso coffee world famous. The designs and technological advances have changed the way the machines look and work but the objective of quality, reliability and the passion for the right espresso every time has remained throughout GAGGIA's history and this is what makes GAGGIA legendary. Coffee machines have evolved from the traditional to fully automated machines, that with a flick of a button, grind, measure and deliver delicious espresso coffee.  FREE 48 hour delivery on all machines, allow 4 days for delivery. Call 0800 321 3357 to order currently available Gaggia Bean to Cup machines and for up to date prices and models available. 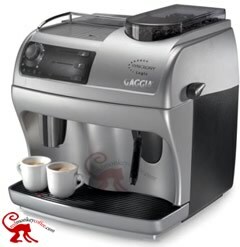 Call 0800 321 3357to order currently available Gaggia Bean to Cup machines and for up to date prices. Call 0800 321 3357 to order. Some Photographs and pages are still to be updated. Photographs below do not always show current models.